We have all listened to the forecaster on the evening news talk about the weather in the Bay Area’s various microclimates. And most of us have had the experience of driving just a few miles through wildly varying weather. 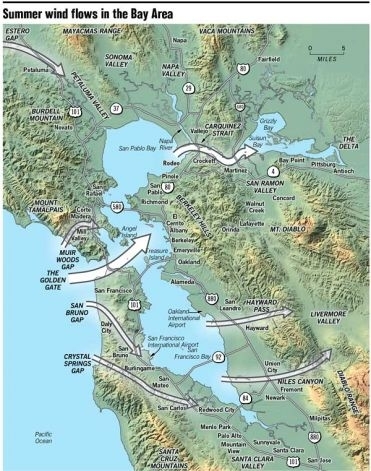 While most of Northern California enjoys a Mediterranean climate with mild, wet winters and hot, dry summers, local weather can change mile by mile. The New Sunset Western Garden Book divides Napa County into four climate zones. Each zone is influenced by elevation, slope and exposure. But what does that really mean to the Napa Valley gardener? Take a walk through your own garden and notice the variation in light, temperature and moisture. A journey of just a few feet in your own backyard may take you from one set of conditions to another. In all likelihood, your garden is a collection of discrete areas with different environmental characteristics and planting possibilities. Use these four groups as a framework. At the nursery, you’ll find most plants labeled with information about suitable climate zones, sun versus shade preference, drought tolerance, full-grown size, and disease and pest problems. Use this information to match plants to the right spot in your garden. The following plant suggestions come from the University of California Cooperative Extension’s “Healthy Garden Tips: Creating Microclimates in the Garden,”adapted from an articleby Peggy Sullivan. For dry soil in sun: Consider silver bush, flannel bush, red monkey flower, lavender, rosemary, ornamental grasses, agapanthus, lemon thyme and mint. For dry soil in shade: Consider ceanothus, monkey flower, California wild fuchsia, Siberian and Japanese iris, and New England aster. For moist soil in sun: Consider spider wort, cardinal flower, ribbon grass, horsetail and hosta. For moist soil in shade: Consider ferns, broad-leafed bergenia, dogwood, azalea, Japanese maple, elephant’s ear, maidenhair fern, tree fern, common calla, caladium and hosta. Keep in mind the seasonal variation in sunlight. One of the most changeable factors in my own yard is the play of sun versus shade. I have areas that receive full sun year round and others that are shaded most of the time. A south-facing wall regularly gets eight hours of sun and is great for vegetable growing. Since the area receives drip irrigation, it’s an example of moist soil in sun. Just steps away, an area under a grapefruit tree in the lee of a garden shed is in perpetual shade—an example of moist soil in shade. Other areas only receive sun when the leaves have dropped from the neighbor’s trees. These zones provide havens in the summer for plants that prefer shade while providing sunny exposure for cool-weather growers. Just as bodies of water, mountains, hills and valleys affect wind patterns and temperatures, so do the structures and the terrain on your property. South- and west-facing stucco walls provide radiant heat that can help ripen summer vegetables. The growing season of a frost-tender plant can be extended by planting it here. Eaves can provide a measure of frost protection and relief from direct rain for delicate plants. Fences can provide zones of shade along the south side of a yard and zones of reflected heat on the north side. North walls receive little direct sun and provide shelter for plants that prefer a shady environment. Trees and hedges can act as wind breaks. Planting on sloping ground takes advantage of the warming of cold air as it flows downhill. Finding the right plant for the right place goes beyond choosing appropriate size and desirable color. Knowing the different environments in your garden can aid you in making more informed plant choices. With an eye to a year-round garden, choose plants and vegetables that bloom and produce in different seasons and that thrive in the conditions that change foot by foot and month by month in your garden. Vegetable Workshop: Napa County Master Gardeners will lead a workshop on “Cool Season Veggies” on Sunday, August 18, from 2 p.m. to 4 p.m. at the Yountville Community Center, 6516 Washington Street, Yountville. 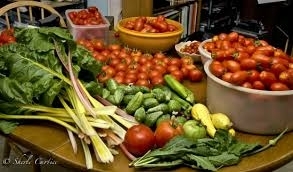 Grow your own vegetables even when days are short and nights are cold. The key is starting while weather and soil are still warm. Learn which vegetables will thrive in cooler temperatures, how to protect them from heat when they are getting started, and how to time plantings for months of harvest. $15 per person ($10 for Yountville residents). Register through Town of Yountville, Parks and Recreation: Mail in or Walk in registration (cash or check only). For additional information, call (707) 944-8712 or visit their web site. Master Gardeners are volunteers who help the University of California reach the gardening public with home gardening information. Napa County Master Gardeners ( http://ucanr.org/ucmgnapa/) are available to answer gardening questions in person or by phone, Monday, Wednesday and Friday, 9 a.m. to Noon, at the U. C. Cooperative Extension office, 1710 Soscol Avenue, Suite 4, Napa, 707-253-4143, or from outside City of Napa toll-free at 877-279-3065. Or e-mail your garden questions by following the guidelines on our web site. Click on Napa, then on Have Garden Questions? Historically, July is the hottest month of the year in Napa County. It is also one of the months with the most daylight hours, so the primary garden task this month is watering. Review your landscape’s watering zones and adjust your watering schedule to keep plants from drying out. In general, larger plants and trees need less frequent but deeper watering than smaller annual plants. Avoid watering by hand. Most people don’t do it thoroughly or deeply enough. Set up drip systems, soaker hoses and sprinklers for specific areas. If you use an automatic controller, check it regularly to be sure it is working correctly. Water plants early in the day so any wet foliage has time to dry before evening. Don’t water during the hottest part of the day or when the wind is blowing or you’ll lose a lot to evaporation. Mulching around perennial plants and trees helps conserve moisture and discourages weeds. Keep mulch a few inches away from tree trunks and woody stems to prevent crown rot and other fungal diseases. If you are growing California native plants, research their water needs before irrigating. Some California natives appreciate a bit of water during the dry season, but many are dormant now and will fare poorly if irrigated. In the vegetable and annual flower beds, deep-rooted plants like tomatoes should be watered well at least once a week. Shallow-rooted plants require shorter but more frequent watering, two or more times per week. Fire danger is high in July. If you haven’t already done so, consult the Napa Firewise website (www.napafirewise.org) for tips on making your home and property as fireproof as possible. Mow weeds and grass regularly until they stop growing. Remove dead and dry material from shrubs and trees, and dispose of this flammable debris in your yard-waste bin. Stack firewood away from structures, and trim tree branches away from your roof. The Napa Firewise website has many other suggestions for creating defensible space around your home. To promote more blooms, deadhead flowering plants regularly. Clean up all fallen fruits, vegetables, clippings and flower petals to eliminate homes for insects and snails and to discourage disease. Add this debris to your compost pile. This month you should be reaping lots of fruits and vegetables. Depending on your spring planting, you might be harvesting basil, beans, beets, carrots, parsnips, leeks, chard, cilantro, cucumbers, squash, lettuce, kale, parsley, peas, tomatoes, peppers, eggplant and tomatillos. In the orchard there may be figs, peaches, nectarines, plums, prunes, apples and pears. Keep up with harvesting to have the best-quality produce for your table. If you have more than you can use, share with a neighbor or the food bank. With the vegetable garden growing so well, now is a good time to fertilize. If you are using a commercial product, follow package instructions. Granulated fertilizers can be sprinkled around plants, scratched into the top inch of soil and then watered in well. Liquid fertilizer such as compost tea is easy to apply and gives your plants a much needed boost this time of year. While you’re at it, give citrus trees a feeding, too. There is still time to plant marigolds, petunias, sweet alyssum and zinnias. Check with a local nursery for more ideas to brighten your flower beds. In the vegetable patch you can still sow seeds of beans, corn, lettuce, summer squash, cucumbers, cilantro and dill. Set out basil, lettuce and chard seedlings. When in doubt about whether there’s enough growing season left, check the “days to maturity” on the seed packet or plant label. We typically have warm weather through the end of September or middle of October, enough time for many vegetable seeds to sprout and produce a crop. You can also begin planning now for the fall and early winter garden. If you like to grow vegetables from seed, late July is a good time to start broccoli, cauliflower, cabbage and kale. With so much to do in July, it’s a good thing that the days are long. Pause often to enjoy what grows in your garden. Make notes on what’s doing well and what you want to do differently next year. When planning the summer garden next winter, you’ll be glad you did. 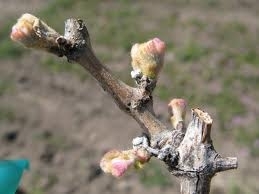 It is about that time of year when any of us who have a small home vineyard or acres of vineyards anticipate bud break. By now we have all done our pruning on the dormant vines and are waiting for the first signs of a new vintage. But we are also aware that with bud break come all the other concerns in managing our vines: frost protection, rain at the wrong time and powdery mildew. And more powdery mildew. The last few years have taught us to be flexible and not anticipate what nature has in store. Managing the vineyard is less stressful if we know we have done all we can to improve the chances of a successful fall harvest. Powdery mildew is the most serious and widespread disease in California vineyards in terms of cost of control and losses in yield. Wine quality can be affected when as few as 3 percent of the berries are diseased; severe mildew may cause berries to crack, allowing rot-promoting organisms to enter. Surprisingly, powdery mildew is not the same mildew we get on roses. 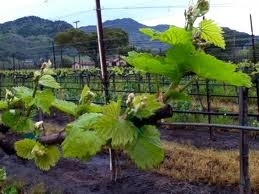 All succulent tissues on a grapevine are susceptible to mildew, and the fungus begins to show shortly after bud break. Usually within one week of the first spring rain you can see colonies on the underside of leaves. The fungus forms a white, web-like mat over the leaf tissue and draws nutrients from the plant tissue. This leaves develop a dusty appearance as the spores spread. How does mildew get started? It cannot grow on dead or dormant grape tissue. It survives the winter under infected buds; or when autumn rains wash the spores off of leaves and shoots and onto the bark of upper trunks and cordons. In the spring, rain and sprinklers release the spores and wind blows them onto newly emerging shoots and leaves. If you had a lot of mildew the previous year, you might see red, stain-like scarring on vine canes. This is dormant mildew. Buds near this scarring will start to be infected. In mild weather, spores germinate in less than five days. Mildew really loves temperatures between 70°F and 85°F. High temperatures kill the spores. And temperatures above 95°F for 12 continuous hours cause the mildew to stop growing. Temperature plays a larger role in the disease development than moisture and humanity. Rain, dew and irrigation water can actually cause poor germination of the mildew spores, and they can sometimes even be washed away. Powdery mildew is spread by windborne spores and they can travel a long distance. The infection in the fruit can continue until certain sugar levels are reached in the grapes. The damage can cause stunted berries, decreased yield, delayed ripening, scarring and off flavors in the wine. Some varieties are more susceptible to mildew, including Chardonnay, Cabernet Sauvignon, Carignane and table grapes. To control powdery mildew, it is best to apply preventatives and keep applying them. It is difficult to eradicate and you need to start early. Many materials can be used. For advice, visit www.ipm.ucdavis.edu/PMG/crops-agriculture.html. Protect vines and new buds and leaves before your vines become infected. Fungicides will inhibit spore development and germination. Sulfur is an effective and economical control and in most years provides adequate protection. Other options are also available. New vines do not need treatment, but in the second year, you should monitor for mildew on leaves. After year two, start the regimen. To summarize, if you grow grapevines, you will have to treat for mildew every year. The control is a preventative. Some products provide longer protection than others. Be sure to watch the weather. Workshop: On Saturday, April 6, from 9:30 a.m. to noon, Napa County Master Gardeners will present a workshop on “Small Home Vineyards” at the Yountville Community Center. The fee is $15. Call 707-944-8712 to register or register online at www.townofyountville.com/index.aspx?page=274. Call the Master Gardener office for more information at 707-253-4221. Master Gardeners are volunteers who help the University of California reach the gardening public with home gardening information. Napa County Master Gardeners (http://cenapa.ucdavis.edu) are available to answer gardening questions in person or by phone, Monday, Wednesday and Friday, 9 a.m. to Noon, at the U. C. Cooperative Extension office, 1710 Soscol Avenue, Suite 4, Napa, 707-253-4143, or from outside City of Napa toll-free at 877-279-3065. Or e-mail your garden questions by following the guidelines on our web site. Click on Napa, then on Have Garden Questions? My worm hobby began in 1999 after I attended a Master Gardener composting class. This hobby continues to fascinate me. Worms recycle my kitchen garbage, and I’m still amazed by the process. Two years ago I went to North Carolina State University’s annual vermiculture conference. The conference was so inspiring that I went again last year. It is the only conference about earthworm farming and mid- to large-scale vermicomposting in North America. The conference, coordinated by a university extension specialist, offers science-based information. One of the topics was the difference between vermicompost tea and leachate. 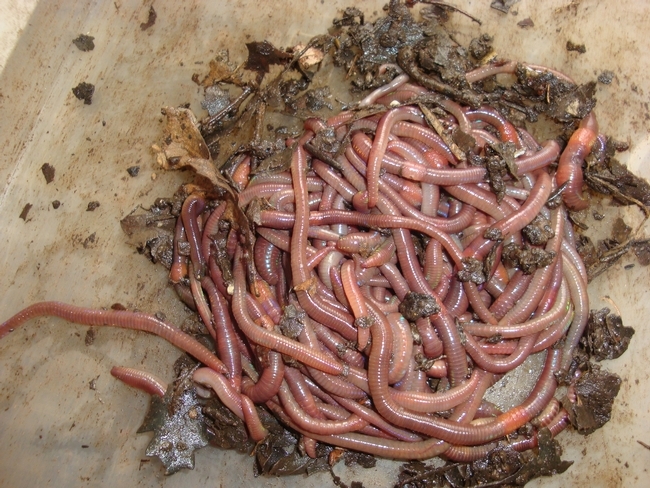 Both begin with red wigglers, which are small earthworms that live near the top of the soil and consume organic matter. I feed my worms kitchen garbage and disease-free plant debris from my yard. My goal is to create vermicompost and aerated compost tea for nourishing a healthy, chemical-free garden. To make aerated compost tea, you need a 12- to 24-hour aeration cycle, de-cholorinated water and finished compost. Alternatively, you can make the tea in a bucket in three to seven days by stirring occasionally. By introducing air, you encourage the proliferation of aerobic microorganisms and discourage the anaerobic microorganisms that may produce byproducts unfavorable to plant growth. Vermicompost tea contains a large diversity of bacteria, fungi, protozoa and nematodes. These microorganisms increase soil biological activity, encourage plant vigor, yield, bud break, fruiting, flowering, color, root volume, seed germination, and pest and disease resistance. You can use vermicompost as a foliar spray or soil drench. Many worm composters are unfamiliar with the topic of aerated compost tea, preferring to use the leachate that many vermicompost systems encourage. Although leachate seems to benefit plants, it comes with some risk. Research suggests that the use of leachate should be discouraged. Vermicompost is not leachate. The excess water that drips through a worm bin is leachate. It picks up undigested material which may contain pathogens and chemicals toxic to plants and humans. A properly maintained worm bin will not collect or seep excess water or leachate. Use leachate to water a favorite weed, or flush leachate down the toilet. Using leachate on plants, especially edibles, is not worth the risk of pathogenic contamination. As for the vermicompost produced by red wigglers in the worm bin, the worms and microbes gobble up the pathogens in their environment and do not release the pathogens back into the soil. Microbes are part of a worm-bin ecosystem. They live and work amongst the worms in the vermicompost, eating and overpopulating the pathogens while being ingested by the worms. The vermicompost is ready to use when you don’t recognize the original feed stock. It should smell clean and earthy and appear brown and crumbly. So why use aerated compost tea? Because it adds organic life to the soil, improves soil structure, water retention, root depth and growth. A foliar spray of vermicompost tea protects plants from pests and diseases, thus reducing the need for chemicals. I love the idea that my plants seem happier and stronger due to my kitchen waste. Be sure to use non-chlorinated water when making tea or watering your worm bins. City dwellers can set a jug or bucket of water out for 24 hours to de-gas the chlorine. Rain water collected in buckets is a good alternative. Workshop: Napa County Master Gardeners will present a workshop on “Fruit Tree Pruning” on Saturday, February 9, at the University of California Cooperative Extension (address below). The morning session (from 9:30 a.m. to 11:30 a.m.) will consist of an indoor lecture. The afternoon session (from 12:30 p.m. to 2:30 p.m.) will consist of a hands-on workshop outdoors in an orchard. You will learn techniques to keep your fruit trees healthy and productive. Online registration (credit card only); Mail in registration (cash or check only). Master Gardeners are volunteers who help the University of California reach the gardening public with home gardening information. Napa County Master Gardeners (http://cenapa.ucdavis.edu) are available to answer gardening questions in person or by phone, Monday, Wednesday and Friday, 9 a.m. to Noon, at the U. C. Cooperative Extension office, 1710 Soscol Avenue, Suite 4, Napa, 707-253-4221, or from outside City of Napa toll-free at 877-279-3065. Or e-mail your garden questions by following the guidelines on our web site. Click on Napa, then on Have Garden Questions? We have all watched fruit trees grow and change through the seasons. 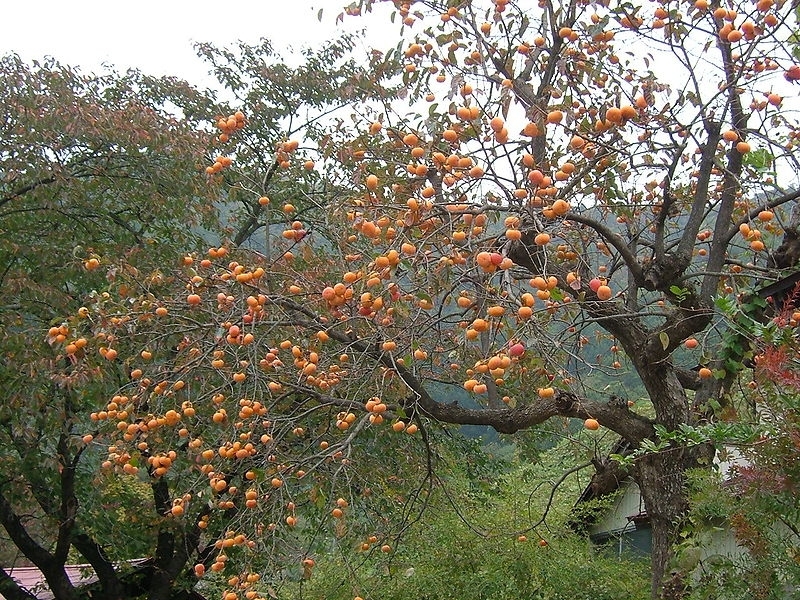 Fruit and nut trees grow most rapidly in the spring and summer months. As summer progresses, the growth rate slows until it all but stops in the fall. Days shorten, temperatures drop and the trees drop their leaves. Finally, the trees go dormant for winter. It might not look like much is happening outdoors during the next few cold months of dormancy, but fruit and nut trees’ hormonal systems are hard at work. The longer, cooler days trigger hormonal growth inhibitors. Trees produce these hormones to prevent them from growing in winter and being damaged by cold. During its dormancy, if a tree has not received sufficient chill hours, even a warm spell with perfect conditions will not awaken it. Some plants do not have this hormonal protection. Many of us have lost plants that were fooled by an early warm spell and coaxed to bud, only to be killed by a later frost or freeze. Napa County is luckier than many parts of the country. Winters are warm enough here that plants are not usually killed by extreme cold, yet we have enough chilling hours to meet the needs of our fruit trees and promote an abundant crop. Trees have different requirements for the number of hours they need to break dormancy. Almonds require at least 250 to 500 hours at less than 45 degrees Fahrenheit to break dormancy. Pears, including Bartlett and Bosc types, need 700 to 800 chilling hours. Asian pears, which do well in my garden, need only 350 to 400 hours. Most red-skinned apples need a cool climate to develop good color. But while some apple varieties require 500 to 1,000 hours of chilling, others need only 400 to 600 hours. When you shop for apples and other bare-root fruit trees, look at the plant tag to see if your choice has high or low chilling needs. Local nurseries tend to choose varieties suited to our climate, so you will usually find choices that are going to be successful. This is a good reason to buy locally instead of from catalogs that carry plants suited to zones and growing conditions different than ours. We certainly have enough winter chill to grow many kinds of peaches, pears, plums and other fruits and nuts. Take a stroll down the bare-root aisle of your local nursery or home improvement store next month and survey the selection. Just be sure to read the plant tags and ask a nursery professional if you are not sure whether a variety is suited to your microclimate. If your garden does not get much frost, you probably won’t have much luck with sour cherries, which need 1,200 hours of chill. But you still have many options. Figs of all types, Hachiya and Fuyu persimmons, almonds, olives, pomegranates, chestnuts and pecans usually produce abundant crops with a minimum of chill. A mild winter may be pleasant, but it can diminish our future harvests. Warm winters can result in delayed foliation and prolonged blossoming, but the buds deteriorate or drop, yielding few flowers or fruit. December and January are the most important months for meeting chilling requirements. If the temperature falls below 45 degrees Fahrenheit for at least 400 hours in each of these months, and those cold hours are fairly evenly distributed, most of our orchard trees’ needs will be met. Once a fruit tree has accumulated the chilling hours it needs, a period of warm weather will signal to its hormones that it is spring, time to break dormancy and safe to grow. Napa County Master Gardeners (cenapa.ucdavis.edu) answer gardening questions Monday, Wednesday and Friday, 9 a.m. to noon, at the UC Cooperative Extension office, 1710 Soscol Ave., Suite 4, Napa, 253-4221.